It is interesting to compare the preparation for the leg behind head postures in Asymmetric sequence (Day 29 Ekapadasirsasana) and here in the Supine Sequence with the Supta trivikramasana subroutine. In the Asymmetric sequence we have the hip openers of janu sirsasana and Ardha padmasana followed by the archer and heron postures. 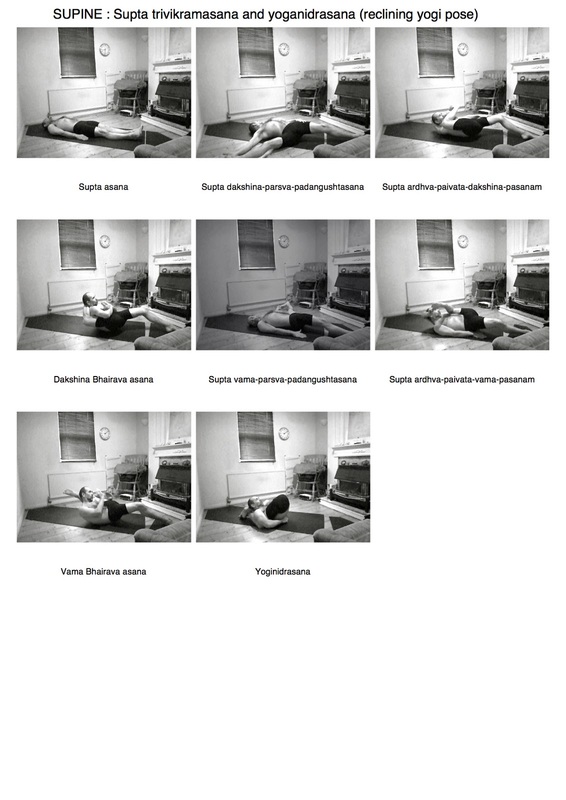 In the Supine sequence we also have a half lotus vinyasa in the dwipadapitam (desk pose) subroutine and the hamstring stretches in the previous subroutine ( Day 62 leg and arm lifts) that include spreading the legs wide and drawing them back and down. In this subroutine the preparation continues. Suptapadangustasana can be practise as part of the previous subroutine or here before moving into the half crossed body pose, sputa ardha-parivarta-dakishina-padangustasana. Of course the postures and subroutines mentioned above are all valid in their own right but it's important to see that the leg behind head postures don't just appear out of nowhere, they are challenging postures and as such are carefully worked towards and prepared for. This should be taken into account when practising at a subroutine rather than sequential level. If in our practise we wish to include some Asymmetric and Supine postures we might include subroutines that prepare for the leg behind head postures in Asymmetric E.G. janu sirsasana, archer, heron but then practice Dakishina bhairva asana (pic 4) in this subroutine. Or we might use similar preparatory postures and subroutines from the On one leg sequence, Vrikmasana, standing march and the uttuta padangustasana subroutine that also lead up to a leg behind head posture, Durvasana. If putting your leg behind your head is not available to you at this time you might work towards it in the eka pada sirsasana subroutine from Asymmetric Series (Day 29) by simple putting your leg over your shoulder, your right leg over your right shoulder say. I practised chakorasana this way for quite some time. If your already able to put your leg behind your head it's still important to make sure your sufficiently warmed up and stretched out. The Utkatasana is a good place to start for the work on the hips, uttanasana for the forward bend and I highly recommend the Uthita padangusthasana and especially the standing marchi subroutines. The standing marchi will do a good job of pushing your hip back. When dipping under the the leg slightly twist in towards the inside of the knee, as the foot settles behind the head you can the straighten out of the twist taking the leg a little further and more comfortably over the shoulder. Shuffle the foot a little further behind with your shoulder, you want to have your leg far enough around that the foot isn't pushing too strongly on your neck. I used to try and pull my leg as far behind my head, as far over towards the other shoulder as possible, now I like to take my leg just over my head but as far over to the leg side as possible, this allows me to then shrug my shoulders further through and seems to allow the lag to settle lower and ultimately deeper. this is perhaps more easily seen on the video link above. It's advisable perhaps. to have done some work on back bending postures to make your back stronger before moving on to leg behind head postures. Before folding forward and dip under the leg try to stretch tall out of the pelvis just as in all other forward bends. In Dakishina bhairva asana (pic 4) ground the heel into the mat, better to allow the knee to bend than let the leg come up and flap about as the grounding of the heel will give you some control and stop you from rolling over to the side. In yoga nidra, put the left leg as far behind the head as possible, preferably slightly over the shoulder to take the strain from off of the neck. Hold the right leg lower than normal, at the calf. bring the right foot to the left and use the left foot as a pivot to bring your right foot further down over the ankle and thus deeper behind the head. ideally you want the feet to cross at the ankles and pointing straight. In the beginning you'll be using the ankles to hook the feet together and stop them from slipping further up the neck. Yoganidrasana tends to feel more comfortable than Dakishina bhairva asana as there is more stability. Some call this pose the sleeping yogi pose rather than the reclining yogi, the inhalation will be shallow but try to lengthen/slow the exhalation and relax into the posture. once familiar with yoganidra it's possible to remain in the posture for a considerable time.